Elegant traveling restrooms to enhance your special event. 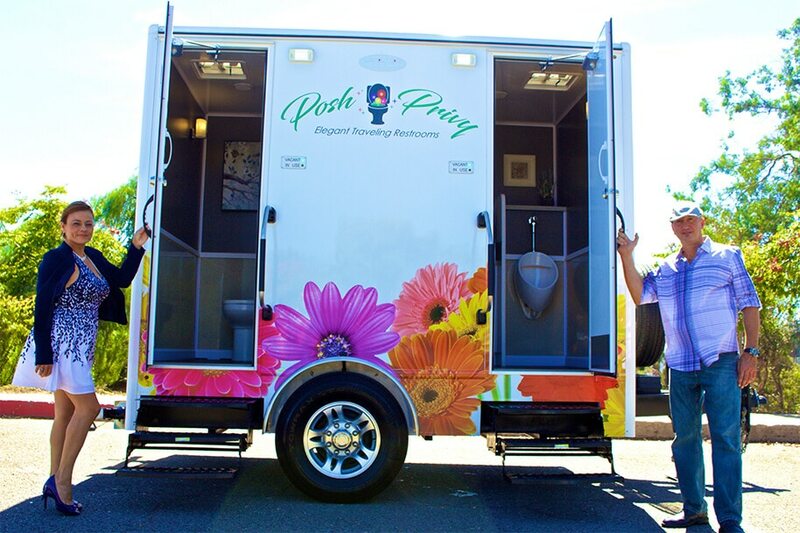 Posh Privy is located in San Diego, CA and was created to fill the niche market of providing elegant traveling restrooms throughout San Diego and surrounding cities. Our mission is to change the paradigm associated with using a portable restroom by offering an upscale alternative to traditional portable restrooms with a personalized approach. Our goal is to change the way people think about using a portable restroom…no longer does this need to be a cringe worthy moment! We offer an alternative, Flowers, Music, Artwork, Air Conditioning, Hot Water and more. Our Vision to redefine the portable restroom experience is achieved by providing elegant traveling restrooms with distinct style and amenities both inside and out. Ron & Yolanda have worked hard to bring the Posh Privy to fruition. These high-end units are expensive, nearly 30 times more than what you may be used to seeing called a VIP restroom. We own them, we take care of them, we service them to keep them as new. There are no third party brokers of trailers or long distance deliveries to worry about. When you contact us you are speaking with the owners. This should be very comforting to you. Our reputation and our success as a business are on the line. We care about you, your event and your guests. Posh Privy is open 7 days a week, 7am-7pm and you may contact us via email anytime. We are Local, our units are right here in the City of San Diego. Long term rentals are available and we can likely help you in last minute emergencies as well. Posh Privy is a Green Company, our units are Solar Powered! If you are in a remote area or no power is available, we can provide service for you. The Posh Privy operates it’s own custom pump truck with new equipment and a friendly operator to service the unit.